How gullible are you? Would you fall for the same scam twice if sold to you by a smiling friendly face? On my first trip to Bangkok in 2008 we arranged a tour to Kanchaniburi through our hotel travel agency. We wanted to be near the river Kwai and the town of Kanchaniburi. We were bussed to the bridge but then discovered we were at least 50 kilometers from our hotel. We made the best of it that time but I only had a brief glimpse of the Bridge over the river Kwai. Now in 2013, as a treat for myself and Shirley, I arranged a tour to Kanchaniburi and the Kwai river. Knowing that this is the sort of thing Michel will never go for I planned a trip to the Tiger Temple and elephant rides for myself and Shirley. The hotel was included. We did not go through the hotel travel agent this time but instead found a travel agency with a representative who spoke good English next to a nice hotel on Khao San Road. Prior to booking we discussed the very busy 3 days of activities with the agent and the hotel that we would stay in called the Bamboo House. The Bamboo House is located at the foot of the Kwai Bridge. The hotel has a good reputation and air-conditioned bungalows on the river. This time I would see Kanchaniburri! The first day of the tour was full of adventure and started at 7am. The small bus full of other tourists (really a MiniVan) picked us up and then we drove for about an hour and a half to visit the floating market. Then back in the van and to a prearranged lunch. Back in the van, to various quick stops and definitely feeling like we were “on a tour” now. One of the stops was right near our hotel. We asked if we could just walk down to it and were told they needed us to meet our new guide for the rest of the tour. We agreed to surrender to the tour process (even Michel). 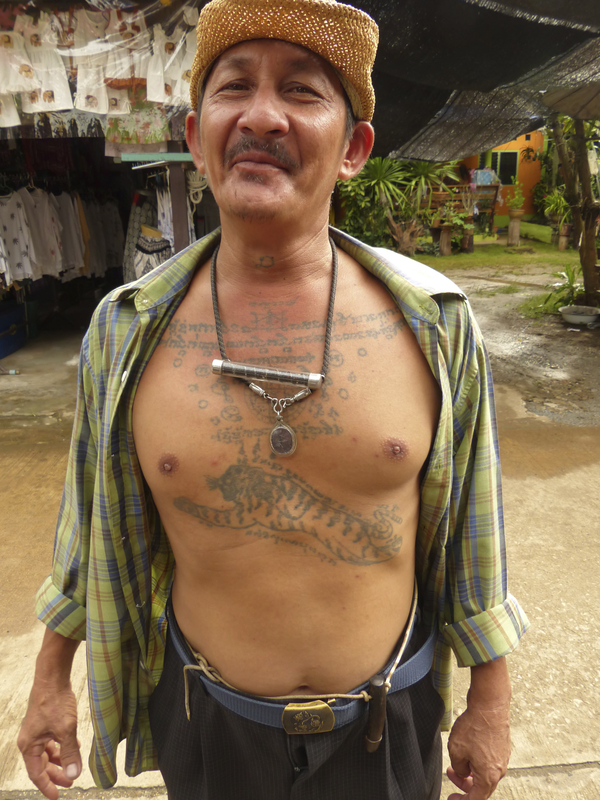 We were driven for another 40 minutes to our guide The tiger man. He took us to see monkeys and then for a ride on the Death Train. The train ride was very beautiful. After the train our guide drove us even further away from the Kwai Bridge and our hotel. We kept asking why and he explained that he was taking the family in the van with us to their hotel. By now the new minivan from the morning was gone. Replaced by a rickety old van that matched the tiger man. After we dropped the family off at their hotel the tiger man took us even further away from our hotel. By that time we knew something was up! When we finally arrived it was 5pm or so. We were in the middle of nowhere looking at shabby huts with tin roofs on the river. A very hostel hotel owner told us that we must stay at this hotel. Leaving would cost 3000 baht. He was not really working to help us leave and we were now left by our guide in the middle of the jungle. After much discussion with my original travel agent (on the phone), the hotel owner, and a women who they both spoke to (real tour owner) it was determined that our travel agent had been incorrect in telling us that we would stay at The Bamboo House but instead meant that we would stay in a bamboo house. Obviously completely untrue as we had discussed the location of the hotel with our travel agent. Eventually the hotel owner backed down and we paid 1500 baht for a ride to The Bamboo House. It was over an hour drive back to Kanchaniburi and the river. The Bamboo House had lovely hotel rooms on and off the water that were available. We settled in very happy about the decision to leave the tour. That night we arranged a trip to the tiger temple ourselves and had a great time. I will write a separate post for the temple. Really a once in a lifetime experience! Lesson learned: don’t arrange tours in Bangkok to the River Kwai. Just take a bus there and then arrange your own activities. If you do arrange a tour anywhere pay with your credit card. They will charge you 3% for using your credit card but we were able to dispute our tour charge through the credit card company. Of course, our story ended with a wonderful experience and in the hotel of our choice. Only a couple of hours of extra driving around and a bit of an argument with the tour company. But as many smiles as we see here in Thailand we now more clearly understand that we are ‘farang’; The white people who come with too much money. Tourism has increased in Thailand in recent years. My observation is that it is taking it’s toll on the Thai people’s attitude toward us. Too many of us coming here without any respect for Thai culture or beliefs has changed the Thai’s attitude toward us. We are accepted as a source of revenue but not really respected. We continue forward with open minds and perhaps more cautiously light hearts. So glad you got back to civilization and nicer hotel safely! What an adventure! That is despicable that you would be misled like that, but I guess the temptation to make some money is too much for those who have so little. Glad you were able to recover and have a great time! Love you all! Completely agree! All part of the fun. :). Great to hear from you. Good to toughen the soul and acclimates you to the territory. We brought back some treasures from Italy. Dinner Friday night. If you can make it we’d love to see you again. Some new wines from Roberto as well, some French no less. The pool is perfect.